Although not all electric brushes are the same, these studies conclude that in general electric brushes are a little bit more efficient in controlling plaque than manual brushes if you use it correctly. Theoretically, you can do a very good brushing with a regular hand brush, but the movements of an electric brush make the task easier and more effective. 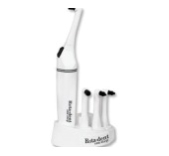 Also, electric brushes like Rotadent have small heads that help you access hard-to-reach areas of your mouth. This aspect is more important when you are talking about someone with orthodontic braces or a history of gum disease. If you have any questions about electric toothbrushes and you live in Aliso Viejo or surrounding area, give us a call today!